We use a variety or waterproofing products and systems for homeowners needing effective water mitigation. While foundation repair will fix structural issues, there are many other problems associated with water surrounding the property, foundation, or basement walls. After repeated exposure to drainage, concrete walls in your foundation may become brittle and in many instances can flake and crumble away. If left untreated, drainage from heavy precipitation or snow-melt can seep via cracked areas in the foundation wall and into the basement. Homeowners often see water stains on floors, walls, boxes and even furniture stored in the area. The loss of strength in your foundation walls can contribute to a noticeable reduction in structural integrity in your home’s foundation and perhaps the structure of your whole home. 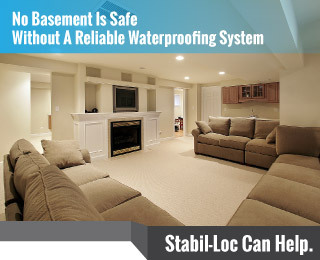 The first step to preventing water seepage is the installation of an reliable, waterproof membrane on the outside of the foundation. The system forces water into a drain pipe system. On the inside of the foundation walls, interior drains can be installed along the basement’s outer edge to send any drainage that seeps through the wall. Moisture collected in the drains is ejected from your home by an automated sump pump system. If you see cracks in your walls or foundation or notice uneven floors, call our local or toll-free number to setup an on-site assessment and free repair estimate. We look forward with great enthusiasm to repairing your foundation to its original integrity with prompt work, a fair price, and a best-in-the-industry guarantee.